After you created a SharePoint source, you can modify a number of advanced parameters to fine-tune indexing of your SharePoint content. Note: You need to rebuild your source after changing advanced parameters. In the Collections section, select the collection containing the SharePoint source for which you want to change advanced parameters. In the Sources section, select the SharePoint source. Specifies whether hidden lists should be indexed or not. SharePoint uses hidden (or internal) lists to store non content information, such as Web Part galleries, work flow state, etc. These lists and their list items are not indexed by default. Specifies whether redundant issues should be indexed or not. When an issue is updated in a SharePoint issue list, SharePoint creates a new issue item, leaving the old one unchanged. These redundant old issues are not indexed by default. Specifies whether survey responses should be indexed or not. When someone responds to a SharePoint survey, this response is stored as a list item into the survey list. These responses are not indexed by default. Specifies whether orphan documents should be indexed or not. Using the WebDAV functionality, it is possible to store documents that do not belong to any SharePoint document libraries. These documents are indexed by default. Specifies whether social tags should be indexed or not. In SharePoint 2010, users can tag content to categorize information in ways that are meaningful to them. Social tagging can improve the quality of search results by filtering against specific tags. The social tags are not indexed by default. When selected, this option slightly affects crawling performances. Note: Only public social tags are indexed, not personal social tags. Specifies whether the connector should cache and reuse the cookies sent by the crawled site. The cookies are enabled by default. Specifies whether the connector should retrieve the SharePoint websites and list children before applying the source filters. This option is required to index a specific part of a SharePoint website or list. This option is disabled by default. Note: Enabling this option slows down the connector as it retrieves all children of all websites and lists from SharePoint and rejects filtered documents just before indexing them. Example: When http://intranet/ is the main website, http://intranet/pages/* is the only source inclusion filter, and Expand sites and lists before applying filters is selected, http://intranet/pages/ and http://intranet/pages/news/ websites are indexed. When Expand sites and lists before applying filters is not selected, nothing will be indexed as http://intranet/ will be filtered out. A document stored in a SharePoint document library may have two different authors, the author of the document stored in the document properties and the author stored in the SharePoint database, which represents the person who has modified or added the document into SharePoint. By default, CES uses the SharePoint author instead of the document author. Select this option to modify this behavior. Note: A side effect of selecting this option is that the CES SharePoint search interface cannot link the search result author to the SharePoint user, as the document author may not be a SharePoint user. Specifies whether Microsoft Office documents should be opened directly within SharePoint (using SharePoint ActiveX) when the user clicks a search result. When this option is not selected, the document is opened outside SharePoint in the corresponding Microsoft Office application. Important: Selecting to index dynamically generated content such as Web Parts may expose secured information as the crawler may see and index content that not all users have access to. Ignores the content of the Web Part pages, including the content of the Web Parts. Indexes the content of all Web Parts in all the Web Part pages. This option is not supported for SharePoint 2003. Indexes the complete Web Part pages as a web crawler would do. Because the full page is indexed, including menus, controls, etc., this option can cause index pollution. Only indexes the content of Web Parts which assembly types are listed in the text box appearing when the option is selected. The Microsoft.SharePoint.WebPartPages.ContentEditorWebPart type appears by default in the text box. This option is selected by default but is not supported for SharePoint 2003. Note: You can find the assembly types of the Web Parts that you want to index from the Site Settings (see Finding the Assembly Type of a SharePoint Web Part). In the Server Name Alias box, optionally enter a server name that, in the index, overrides the one from which documents are downloaded in the index. This parameter is useful to have query results point to a server other than the one used for indexing. Example: Three network load balanced (NLB) SharePoint front-end servers handle the end-users requests and your source crawls a fourth mirror server to not impact performance for users. In the Server Name Alias box, enter the NLB URL to replace the IP address in the index. 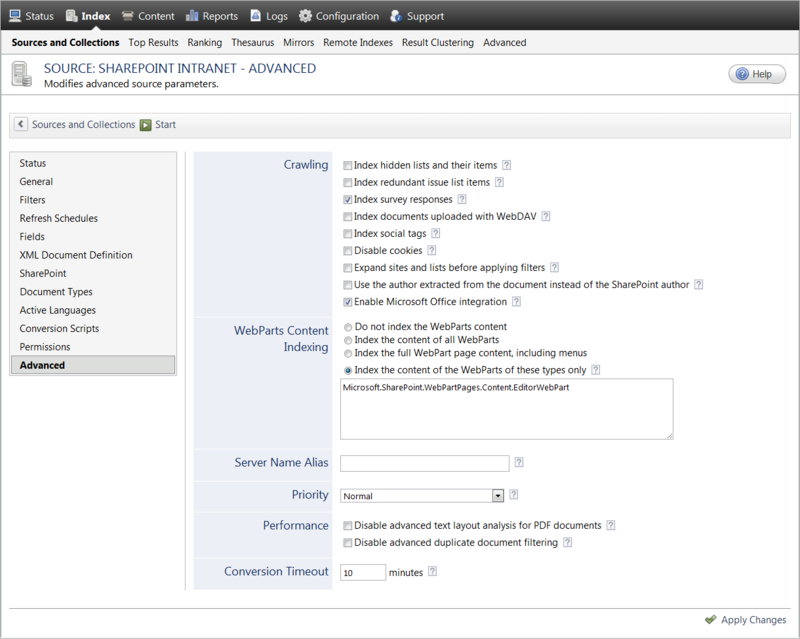 In the Priority drop-down list, select the download priority relative to other SharePoint sources. For better content indexing, CES by default analyzes PDF documents to identify text columns and restore appropriate content ordering. This process can be disabled to save CPU resources while indexing. By default CES applies an advanced filter to display only one copy of each document in the search results. Select this option to disable the filtering of duplicate documents in order to save CPU resources and speed up indexing. In the Conversion Timeout box, enter the number of minutes after which the converter proceeds to another document even if the conversion is not complete. When the timeout occurs, the document for which the conversion was aborted is considered corrupted. By default, the conversion timeout is 10 minutes. Start indexing the source by clicking Start or Rebuild from the button bar at the top of the page.